We are pleased to announce that, from 27 April to 26 October 2019, the Search Room will be open on Saturdays by prior appointment on a trial basis. A maximum of 20 appointments can be received on every Saturday (except public holidays) during the six-month trial period. Details of the arrangements are accessible at this link. A new digital photo album entitled “Activities of Princess Alexandra Community Centre in the 1960s” is accessible here. Talks will be conducted in Cantonese. Limited seats are available on a first-come, first-served basis. Public Engagement Programme: "Childlike Innocence on Camera" and "Share the Joy"
The Public Records Office has for the first time combined the "Pleasure and Leisure: A Glimpse of Children's Pastimes in Hong Kong" exhibition with two public engagement programmes, namely "Childlike Innocence on Camera" and "Share the Joy", inviting members of the public to contribute photographs taken from the 1950s to 1980s that depicted their childhood playtime and contribute plastic or metallic toys popular at any time during the same period. Selected photographs and toys contributed by the public will be uploaded to the exhibition's dedicated webpage and displayed in the Exhibition Hall respectively, thereby completing the exhibition as a collage of fond memories of childhood fun time unique to each and everyone. For details of the public engagement programmes, please click "Childlike Innocence on Camera" and "Share the Joy". Current Exhibition: "Pleasure and Leisure: A Glimpse of Children's Pastimes in Hong Kong"
The Public Records Office (PRO) of the Government Records Service holds the "Pleasure and Leisure: A Glimpse of Children's Pastimes in Hong Kong" exhibition at the Exhibition Hall of Hong Kong Public Records Building starting from today (Feb 25) to showcase how children's pastimes in Hong Kong evolved from the 1950s to the 1980s through the display of a variety of the PRO's holdings. Apart from reliving the joyful childhood moments, one can also learn more about the transformation of our society and livelihood in those years. The dedicated webpage for the exhibition contains reference resources, and information of the upcoming roving exhibitions and talks under the same theme which will be held from the coming April to December at various Hong Kong Public Libraries of the Leisure and Cultural Services Department. Members of the public are welcome to view some 200 photographs from archival holdings which depict interesting moments of childhood playtime in the old days in the "Image Gallery" section of the webpage. Opening hours of Exhibition Hall are from Monday to Friday from 9:00 a.m. to 5:45 p.m. (closed on public holidays). Admission is free. To enhance its existing archival holdings, the Public Records Office (PRO) of the Government Records Service (GRS) has acquired 123 archival records relating to Hong Kong from The National Archives (TNA) of the United Kingdom. These archival records, in the form of digital copies, were put under four manuscript series. They are available for public viewing starting from 25 February 2019. Members of the public are welcome to visit the Search Room of the PRO to inspect these records which have already been included in our online catalogue. The newly acquired record in this new series comprises one digitised record selected from CAB128: Cabinet Office - Cabinet Minutes and Papers (CM and CC Series). The record is about Cabinet conclusions of meetings chaired by the Prime Minister. Matters discussed include Vietnamese boat people and their repatriation, confidence crisis in Hong Kong, nationality issue of Hong Kong people and their right of abode in Britain etc. The covering period of the record is from June 1989 to December 1989. The newly acquired records in this existing series comprise 11 digitised records selected from FCO 21: Foreign Office and Foreign and Commonwealth Office: Far Eastern Department: registered Files (F and FE Series). The records touch on internal politics in the Mainland and issues in relation to student demonstrations in 1989. The covering period of the records is from January to December 1989. The newly acquired records in this existing series comprise 110 digitised records selected from FCO 40: Commonwealth Office and Foreign and Commonwealth Office: Hong Kong Departments: Registered Files, Hong Kong, British Honduras, British Indian Ocean Territories and the Seychelles (HW and HK Series). The records cover a wide range of subjects, including future of Hong Kong, death of Sir Edward Youde, Sino-British Joint Liaison Group, constitutional development and party politics in Hong Kong, parliamentary reports and British policies on Hong Kong, citizenship and nationality issues for Hong Kong people including the ethnic minorities, passports and visas, human rights and Bill of Rights in Hong Kong, defence and public order, shipping, stock market and exchange rate etc. The covering period of the records is from 1967 to 1991. The newly acquired record in this existing series comprises one digitised record selected from PREM 19: Prime Minister's Office: Correspondence and Papers, 1979-1997. It is about the reports on the political and economic situations in the Mainland from 1979 to 1989 by the UK government. To prepare for staging the upcoming thematic exhibition, the Exhibition Hall will be temporarily closed from 21st January 2019. We regret this service is temporarily unavailable. Public Records Office (PRO), Government Records Service (GRS) preserves a collection of audio-visual materials transferred from the Information Services Department (ISD). They record different aspects of Hong Kong society between 1950s and early 1980s. PRO has selected some titles and edited as a thematic film clip of 35-minute length, entitled "Housing in Hong Kong in the 1960s and 1970s”. Through viewing the film clip, the elderly can recall their memory of old Hong Kong and the younger generation can understand the development of Housing in Hong Kong. For details, please see the brief introduction. Starting from 4 January 2019, the thematic film will be available for viewing at 11:00am (English version) and 3:30pm (Cantonese version) on every Friday (except public holidays) in the Visitors' Common Room on 1st Floor of the Hong Kong Public Records Building. Admission is free. For details, please refer to the program. We can entertain up to 20 people in this activity. The seats are reserved for walk-in visitors on a first-come, first served basis. For enquiries or group appointment, please call us at 2195-7700. The new Online Catalogue of PRO holdings known as @PRO came into operation on 17 December 2018. The user guide of @PRO is accessible at this link. @PRO provides a brand new search interface and user-friendly display of search result. It allows users to create account, reserve holdings and apply for access to records through the Internet. Users may also borrow records through the on-site catalogue at the search room of the Government Records Service in Kwun Tong. Users are welcome to explore the new catalogue and provide your feedback or comments to us at (852) 2195 7700 or by emaill proinfo@grs.gov.hk. A new digital photo album entitled “Tung Chung Fort 1978” is accessible here . A new digital photo album entitled “Po Yick Street, Tai Po 1974” is accessible here . A new digital photo album entitled“Nathan Road in the Mid-1970s” is accessible here . The Annual Report 2017 of the Government Records Service has been issued. Please click here to view. In celebration of the International Archives Day, the Government Records Service (GRS) will participate together with local institutions in an exhibition organised by the Hong Kong Archives Society on 9 June 2018. More than 30 replicas of our archival holdings will be exhibited. Our Archivist will also deliver a talk in Cantonese on “The Story of Archives” to highlight the holdings and online resources of GRS. A new price list of our reproduction of holdings and records certification services is effective from 14 May 2018. You may access the price list through this link . For enquiries, please call 2195 7700. The records destruction information of bureaux/departments in 2017 is now accessible here . To enhance its existing archival holdings, the Public Records Office (PRO) of the Government Records Service (GRS) has acquired 41 archival records relating to Hong Kong from the National Archives (TNA) of the United Kingdom. These archival records, in the form of digital copies, were put under one manuscript series. They will be available for public inspection starting from 16 April 2018. Members of the public are welcome to visit the Search Room of the PRO to inspect these records which have already been included in our online catalogue. A brief description of these 41 new archival records is given below. The newly acquired digitised files in this existing series comprise 41 records selected from FCO 40: Commonwealth Office and Foreign and Commonwealth Office: Hong Kong Departments: Registered Files, Hong Kong, British Honduras, British Indian Ocean Territories and the Seychelles. The subjects covered include the future of Hong Kong, drafting of the Basic Law, legal issues arising from Hong Kong’s conversion to Chinese sovereignty, future of the judiciary, Joint Liaison Group and Sino-British negotiations, amending the Crown Proceedings Ordinance, Judicial Service Commission (Amendment) Bill, Hong Kong’s relations with Taiwan, Macao, Mainland China, Japan, the United Nations and other British dependent territories, right of abode in Britain, Vietnamese boat people, water supply, mutual legal assistance, Hong Kong’s participation in international organisations, economic situation in Hong Kong, Daya Bay nuclear plant, student demonstrations in China in 1989, etc. The covering period of the files in this deposit is from 1986 to 1990. A new digital photo album entitled “Gin Drinker's Bay 1958-1959” is accessible here . A new price list of our reproduction of holdings and records certification services is effective from 11 April 2018. You may access the price list through this link. To enhance its existing archival holdings, the Public Records Office (PRO) of the Government Records Service (GRS) has acquired 2 archival records relating to Hong Kong from the Ronald Reagan Presidential Library of the United States. These archival records, in the form of digital copies, were put under the manuscript series of HKMS211-1. They will be available for public inspection starting from 28 March 2018. Members of the public are welcome to visit the Search Room of the PRO to inspect these records which have already been included in our online catalogue. A brief description of these 2 new archival records is given below. This new series consists of digital images of two files from the White House Office of Records Management (WHORM), USA. They cover a range of issues, including communication between White House and Sir Yue Kong Pao, views among US officials and American business community on the U.S. position on Hong Kong, the Sino-British negotiations and the future of Hong Kong, trade and finance matters between Hong Kong and the USA, etc. The covering period of the records is from 1981 to 1987. Roving exhibition "Tracking Winds and Clouds: A Century of Archived Stories of the Observatory"
To enhance its existing archival holdings, the Public Records Office (PRO) of the Government Records Service (GRS) has acquired 105 archival records relating to Hong Kong from the National Archives (TNA) of the United Kingdom. These archival records, in the form of digital copies, were put under three Hong Kong Manuscript Series (HKMS). They will be available for public inspection starting from 12 February 2018. Members of the public are welcome to visit the Search Room of the PRO to inspect these records which have already been included in our online catalogue. A brief description of these 105 new archival records is given below. The newly acquired digitised files in this existing series comprise three digitised records selected from FCO 21: Foreign Office and Foreign and Commonwealth Office: Far Eastern Department: registered Files. The subject of these files is about the visit of the UK Prime Minister, Margaret Thatcher, to China. The covering period of the files is 1984. The newly acquired digitised files in this existing series comprise 92 records selected from FCO 40: Commonwealth Office and Foreign and Commonwealth Office: Hong Kong Departments: Registered Files, Hong Kong, British Honduras, British Indian Ocean Territories and the Seychelles. The subjects covered include future of Hong Kong, relations between Hong Kong and China, Sino-British Joint Declaration, visits of Chinese officials to UK, visits by Governor of Hong Kong to UK and China, appointment of new Governor of Hong Kong, constitutional development, localisation of civil service, nuclear power station project at Daya Bay, localisation of civil aviation legislation, Hong Kong International Airport, nationality and passport. The covering period of the files is from 1986 to 1988. The newly acquired digitised files in this existing series comprise 10 records selected from PREM 19: Prime Minister's Office: Correspondence and Papers, 1979-1997. They are related to political and social-economic matters involving Hong Kong. The subjects cover the Prime Minister’s visit to China and Hong Kong, power station projects and the future of Hong Kong, etc. The covering period of most of the files is from 1984 to 1989. Current Exhibition: "Tracking Winds and Clouds: A Century of Archived Stories of the Observatory"
The exhibition “Tracking Winds and Clouds: A Century of Archived Stories of the Observatory”, co-organised by the Public Records Office of the Government Records Service and the Hong Kong Observatory, will be launched on February 6 at the Exhibition Hall, 2/F, Hong Kong Public Records Building, 13 Tsui Ping Road, Kwun Tong, Kowloon. Opening hours are from 9am to 5:45pm, Mondays to Fridays (except public holidays). All are welcome and admission is free. More than 40 pieces of archival holdings will be displayed to review the early establishment and operation of the Hong Kong Observatory, giving members of the public a glimpse of the precious meteorological records. In addition, roving exhibitions of “Tracking Winds and Clouds: A Century of Archived Stories of the Observatory” will be held at Sha Tin Public Library (from March 2 to 29, 2018), Ping Shan Tin Shui Wai Public Library (from April 2 to 29, 2018), Chai Wan Public Library (from August 2 to 30, 2018) and Kowloon Public Library (from September 2 to 29, 2018). Please refer to the Reference Resources Page for details. 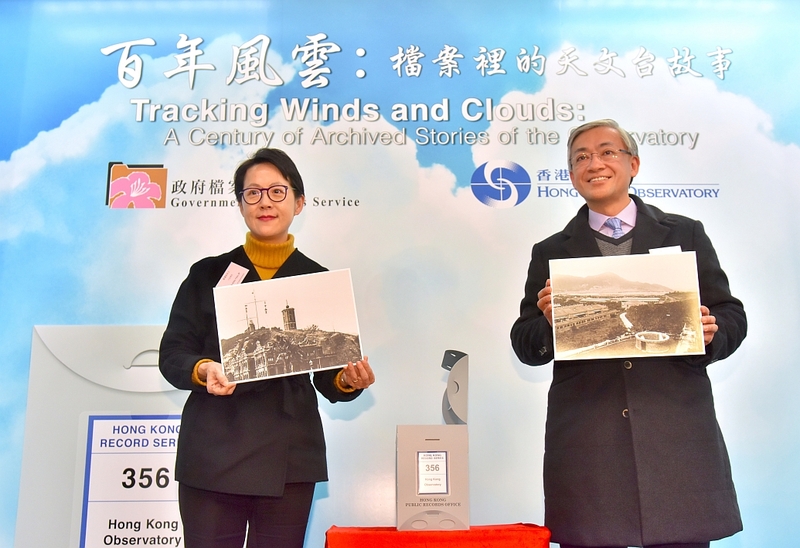 The opening ceremony of the exhibition "Tracking Winds and Clouds: A Century of Archived Stories of the Observatory" was held on February 5 at the Hong Kong Public Records Building. Picture shows the Director of Administration, Ms Kitty Choi (left), and the Director of the Hong Kong Observatory, Mr Shun Chi-ming (right), officiating at the opening ceremony. Press release of the opening ceremony and exhibition is accessible here. To prepare for staging the upcoming thematic exhibition “Tracking Winds and Clouds: A Century of Archived Stories of the Observatory”, the Exhibition Hall will be temporarily closed from 8th January to 5th February 2018. The Exhibition Hall will be open to public starting from 6th February 2018. We regret this service is temporarily unavailable. PRO has selected some titles and edited as a thematic film clip of 30-minute length, entitled “Hong Kong in the 1960s and 1970s”. Through viewing the film clip, the elderly can recall their memory of old Hong Kong and the younger generation can understand the development of Hong Kong. For details, please see the brief introduction. Starting from 5 January 2018, the thematic film will be available for viewing at 11:00am (English version) and 3:30pm (Cantonese version) on every Friday (except public holidays) in the Lecture Hall on 2nd Floor of the Hong Kong Public Records Building. Admission is free. For details, please refer to the program. We can entertain up to 40 people in this activity. The maximum number of seats reserved for group visitors is 30 seats and 10 seats are reserved for walk-in visitors on a first-come, first served basis. For enquiries, please call us at 2195 - 7700. A new digital photo album entitled “Vietnamese Refugee Boats, 1979-1981” is accessible here . A new digital photo album entitled “Public Estates, 1970” is accessible here . A new digital photo album entitled “Tai Kok Tsui Workshops, 1955” is accessible here . The Annual Report 2016 of the Government Records Service has been issued. Please click here to view. The Government Records Service has launched its revamped website today. We hope that the new design can enhance the user experience and promote awareness, appreciation and proper use of documentary heritage in our community. The records destruction information of bureaux/departments in 2016 is now accessible here. A new digital photo album entitled “University of Hong Kong, November 1945” is uploaded to the Educational Resources Portal and accessible here. To enhance its existing archival holdings, the Public Records Office (PRO) of the Government Records Service (GRS) has acquired 144 archival records relating to Hong Kong from the National Archives (TNA) of the United Kingdom. These archival records, in the form of digital copies, were put under the manuscript series of HKMS189-8. They will be available for public inspection starting from 3 April 2017. Members of the public are welcome to visit the Search Room of the PRO to inspect these records which have already been included in our online catalogue. A brief description of these 144 new archival records is given below. This new deposit comprises 144 digitised records selected from FCO 40: Commonwealth Office and Foreign and Commonwealth Office: Hong Kong Departments: Registered Files, Hong Kong, British Honduras, British Indian Ocean Territories and the Seychelles. The subjects covered include future of Hong Kong, visit by Margaret Thatcher (UK Prime Minister) to Beijing, visits to Hong Kong by the members of the UK Parliament, Secretary of State for Foreign Affairs, FCO officials, and other UK officials, visits by officials from China to Hong Kong, visits to the UK by official and non-official members of the Executive Council, nationality and citizenship, Basic Law, Parliamentary debates, future meetings of the Sino-British Joint Liaison Group, internal political situation in Hong Kong, economic policy and situation, public finance, Vietnamese refugees, constitutional development and reforms, relations between Hong Kong and other regions, such as Taiwan, Macao, United Nations, proposed realignment of the Shenzhen River, etc. The covering period of the records in this deposit is from 1974 to 1986. Roving exhibition "Great scenery along the way: Exhibition of street scenes at bus stops on Hong Kong Island in the 1970s"
To promote the appreciation of archival holdings, PRO has selected some titles and edited as a thematic film clip of 40-minute length, entitled “Features of Hong Kong and the New Territories (1960s-70s)”. Through viewing the film clip, the elderly can recall their memory of old Hong Kong and the younger generation can understand the development of Hong Kong. For details, please see the brief introduction. Starting from 6 January 2017, the thematic film will be available for viewing at 11:00am (English version) and 3:30pm (Cantonese version) on every Friday (except public holidays) in the Lecture Hall on 2nd Floor of the Hong Kong Public Records Building. Admission is free. For details, please refer to the program. We can entertain up to 40 people in this activity. The maximum number of seats reserved for group visitors is 30 seats and 10 seats are reserved for walk-in visitors on a first-come, first served basis. For enquiries, please call us at 2195 7700. Current Exhibition: "Great scenery along the way: Exhibition of street scenes at bus stops on Hong Kong Island in the 1970s"
The “Great scenery along the way” exhibition has been launched since 16 December 2016 at the Exhibition Hall, 2/F, Hong Kong Public Records Building, 13 Tsui Ping Road, Kwun Tong, Kowloon. Opening hours are from 9am to 5.45pm, Mondays to Fridays (except public holidays). All are welcome and admission is free. By displaying around 60 photographs and documents from a series of traffic survey files, the exhibition showcases the scenes of bus stops along the coast of Hong Kong Island. Under the themes of buildings, businesses, everyday life and transport, the exhibition enables people to revisit the unique and interesting scenes along the bus routes on Hong Kong Island in the 1970s, including General Post Office Building, Haw Par Mansion, tram trailer car, students carrying trendy school bags, etc. In addition, roving exhibitions of “Great scenery along the way: Exhibition of street scenes at bus stops on Hong Kong Island in the 1970s” will be held at Ping Shan Tin Shui Wai Public Library (from 2 to 29 April 2017), Chai Wan Public Library (from 5 to 18 June 2017), Sha Tin Public Library (from 2 to 29 September 2017) and Hong Kong Central Library (from 19 to 24 October 2017). Please refer to the Reference Resources Page for details. To enhance its existing archival holdings, the Public Records Office (PRO) of the Government Records Service (GRS) has acquired another 81 archival records relating to Hong Kong from the National Archives (TNA) of the United Kingdom. These archival records, in the form of digital copies, were put under 1 manuscript series. They will be available for public inspection starting from 14 December 2016. Members of the public are welcome to visit the Search Room of the PRO to inspect these records which have already been included in our online catalogue. Together with the 109 archival records previously acquired, a total of 190 archival records are now open for public viewing. A brief description of these 81 new archival records is given below. This new deposit comprises 81 digitised records selected from FCO 40: Commonwealth Office and Foreign and Commonwealth Office: Hong Kong Departments: Registered Files, Hong Kong, British Honduras, British Indian Ocean Territories and the Seychelles. The major subjects of these files are about the future of Hong Kong and related matters, such as visit of UK Prime Minister to Hong Kong and China, other visits to Hong Kong by the members of the UK Parliament, Secretary of State for Foreign Affairs, FCO officials, and other UK officials, visits by officials from China to Hong Kong, visits to the UK by official and non-official members of the Executive Council and businessmen from Hong Kong, Hong Kong Governor's visit to the UK and Macao, etc. The covering period of the records is from 1980 to 1984. To enhance its existing archival holdings, the Public Records Office (PRO) of the Government Records Service (GRS) has further acquired 109 archival records relating to Hong Kong from the National Archives (TNA) of the United Kingdom. These archival records, in the form of digital copies, were put under 6 manuscript series. They will be available for public inspection starting from 14 December 2016. Members of the public are welcome to visit the Search Room of the PRO to inspect these records which have already been included in our online catalogue. A brief description of these new archival records is given below. The newly acquired digitised files in this existing series comprises 24 digitised records selected from FCO 21: Foreign Office and Foreign and Commonwealth Office: Far Eastern Department: Registered Files. The subjects covered include future of Hong Kong, Royal visits, visit of Mr. Atkins (the Lord Privy Seal), relations between Hong Kong and China, UK, Taiwan, air services between UK and China, etc. The covering period of the files is from 1979 to 1982. The newly acquired digitised files in this existing series comprise 38 records selected from FCO 40: Commonwealth Office and Foreign and Commonwealth Office: Hong Kong Departments: Registered Files, Hong Kong, British Honduras, British Indian Ocean Territories and the Seychelles. The subjects covered include visit of FCO officials, appointment of Hong Kong Governor and senior officials in Hong Kong Government, constitutional affairs, UK Nationality Laws, capital punishment, relations between Hong Kong and China, UK, United Kingdom, Macao and Taiwan and the annual review and quarterly progress report on Hong Kong, etc. The covering period of the files is from 1980 to 1982. This new deposit comprises digital images of 6 records selected from CO 323: Colonies, General: Original Correspondence. The subjects covered include the ships S.S. Rajaburi and S.S. Tannefels, taxes on cargo on enemy ships, liquidation of enemy firms, prize court fees and crown agent's balances, etc. The covering period of the files is from 1916 to 1917. This new series comprises 11 digitised images of 11 copies of maps and plans selected from CO 700: Colonial Office and Predecessors: Maps and Plans: Series I. They are maps and plans of Hong Kong. Among them, 7 copies of the maps and plans are about Hong Kong Island between 1865 and 1901, others are maps and plans about China, Kwangtung Province (Sun-On district), water supply in Kowloon Peninsula, sewerage works and the New Territories. The covering period of the files in this series is from 1865 to 1903. This new series contains 29 volumes of photo albums selected from CO 1069: Colonial Office and successors: Photographic Collection. They are photos about the scenery of Hong Kong between the 1860s and the 1960s. Some of the photo albums, other than the scenery of Hong Kong Island, are about specific topics, such as natural disasters, scenery of Kowloon Peninsula and the New Territories, New Territories boundary delimitation, Silver Jubilee Dragron Procession, Surrender Ceremony, decorations for Chinese National Day celebration and outside and interior scenes of buildings, such as the Government House and Northcote Training College. Besides, one photo album contains photos about Singapore, Java, Indo-China, Shanghai, Japan and the Suez Canal in the late 19th Century and there are photo albums about the Commonwealth universities in the 1960s. The covering period of the photo albums in this series is from 1860 to 1969. This new series contains digitised images of one photo album extracted from a record of CO129: War and Colonial Department and Colonial Office: Hong Kong, Original Correspondence (CO 129/498/26). Images in this album are about the Marble Hall, the residence of Sir Paul Chater in 1926. Images about the University of Hong Kong, Luen Wo Road, Vietnamese Boat People and Railway Stations in the Post War Period have been uploaded to the thematic webpage “History in Pictures” on 7 September 2016. You may click here to access the webpage. To promote awareness and appreciation of documentary heritage in our community, Public Records Office (PRO), Government Records Service (GRS) has selected 25 photos about hawkers from a report entitled “The Hawker Report, 1957: Supplementary Notes” and presented them to users as a digital photo album. The album is uploaded to the Educational Resources Portal and accessible through this link.